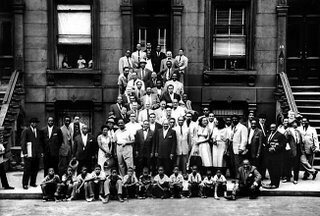 On the surface, this doesn't seem like such a remarkable shot: a grouping of people posing for a portrait, mostly black men but including women, whites, and children, on the steps of a city brownstone and spilling down onto the sidewalk, in Harlem, on the island of Manhattan. However, a large part of great photographs is their significance. And the significance of this amazing picture, taken in 1958 by photographer Art Kane, is nearly fathomless. It's a characteristic of any true renaissance period that it seems to overflow with genius. Giants proliferate, and even the second-rank people are legitimate geniuses who might dominate any other age. One such coalescence of all of the conditions of renaissance occurred in America in the latter half of the 1950s. Although jazz was soon to be doomed by the twin juggernauts of American rock and roll and the "British invasion" personified by four young Liverpudlians, in 1956-1959 it was one of those rare cases of an art form becoming fully mature while it still remained popular and was still very central to mainstream culture. When this picture was taken in 1958, jazz had well over half a century's history as a dominant popular music. It was also the most technically demanding music ever to achieve such popularity. Yet it was smack in the middle of its last great period of innovation. One could spend almost a lifetime coming to a full appreciation the congress of genius pictured here. There are two websites, harlem.org and the photographer's site, artkane.com, where you can put all these faces together with their names. 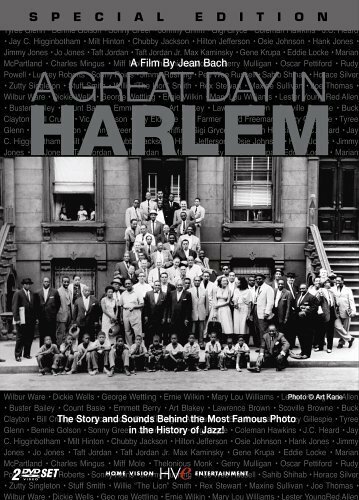 There's also a documentary movie about the picture, available on DVD, called "A Great Day In Harlem " (right). The picture has old and young, black and white, swing-era big-band to the most modern avant-guard. Count Basie sat down on the curb to rest, and one brave neighborhood kid hesitantly joined him. The ice broken, a bunch of other kids put themselves into the picture (can any of you pros out there imagine an A.D. suffering such a thing in a similar shoot today?). On the far right, two of the greatest trumpeters in history, Roy Eldridge and Dizzy Gillespie, are joking with each other. Towering over them, pale as a ghost, is red-haired Gerry Mulligan. Front and center is Coleman Hawkins, who was coming off one of his best years ever, at least in terms of music on record; just to his left, our right, both wearing shades, are Sonny Rollins and Thelonious Monk. (Monk arrived late; he wanted to make sure he would be last to arrive, so he'd have to go in front—and he wore a light jacket assuming that everyone else would be dressed in dark suits.) Pianist Marianne McPartland and the now-neglected Mary Lou Williams stand side-by-side. Cigarette in mouth, up on the steps, is a young man named Charles Mingus. Both Art Blakey and Gene Krupa were there. So is Milt Hinton. So is Art Farmer. Rememberr Zutty Singleton, who I wrote about a few days ago? He's up on the steps. The great stride pianist Luckey Williams is in the picture...and believe it or not, Willie The Lion Smith was there that day, but for some reason isn't in the final shot! On the right, in back (and wearing his trademark pork-pie hat, even), is Lester Young; opposite him, seemingly glowering at the camera, is Horace Silver. The list goes on. The appreciate the biographies of all these people is to immerse oneself in the history of jazz. Just remarkable. It's as if all the German and Austrian classical composers had gathered for a group portrait that included Haydn, Mozart, Beethoven, and Schubert, or if somehow we could have a group portrait of all the major Italian Renaissance artists gathered together, old Leonardo next to young Raphael, or all the impressionists. Or all of the Athenian philosophers. All would be as august as this group, but none more so. Of course, one might wish that Art Kane had used a bigger camera: the limits of the film's and the lens's resolution are pushed hard by the many faces that are so tiny on the negative. But don't be too hard on him. When he shot it for Esquire magazine, it was literally his first assignment ever. first I feel a little trickle down my neck, followed by goosebumps on my shoulders and arms and then my eyes start to water...thanks Mike! Funny thing, Mike, I know of an identical sort of pic from a completely different genre -- Indian classical music. 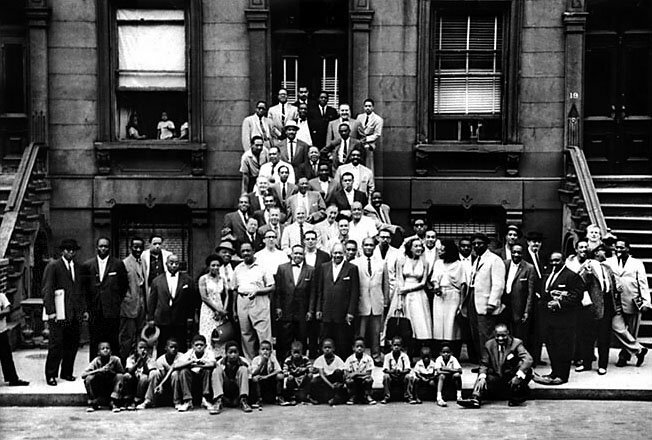 Granted, it never achieved the worldwide popularity of jazz and is unlikely to, but for someone who is familiar with it this picture is the absolute who's-who shot, taken around the middle of the century. I don't know what brought all these people together. Two names you may have heard of are Ravi Shankar and Ali Akbar Khan, (then) young men standing in the second row just behind the seated lady. I thought that your "10 greatest" photos was going to be an interesting list. It has become apparent that you are unable to distinguish the difference between a great photograph and a photograph of a significant pop-culture event. You are MTV, not PBS. Perhaps you and I don't have the same understanding of what photography is good for. "... MTV, not PBS." ? "Yet it was smack in the middle of its last great period of innovation." It was definitely an interesting time since so many different styles of jazz were intermingling and at one stage of their development or another. And don't forget that Bebop basically drove away fans from jazz. It was only Cool that brought them back again in 1949 (and even then not in the droves that the Swing Era had), which is why Gerry Mulligan is there at all. Still, almost every style of jazz is represented - bebop, swing, cool, hard bop, stride/new orleans (the lion), even KSC boogie-woogie to some extent in Mary Lou Williams. Something telling about the history of jazz is how many of those folks are from Kansas City (and New York). I've definitely got to get the DVD. You'll definitely enjoy it. It's a great window into the "jazz life." The picture, it turns out, was also a big social event, people who seldom saw each other mingling, meeting, and greeting. It took Kane more than an hour to get people to actually hold still for the picture. A story about this picture, told I am informed by Milt Hinton (his wife made home movies of the event and Milt used his Leica for 35mm shots--they're in the movie) is that some of these musicians learned that a day has two ten o'clocks! Great choice. As a photographer and a jazz fan, I have always loved this photo--I have the poster version hanging in my darkroom. I beg to differ from the person who thinks this may not be a great photograph. I have been looking at it for years and to me it's an example of one of the ways a photograph can be great--it's a timeless document of a particular time and place, it's a record of an event that would not have taken place without the photographer. But it's also, despite being grainy, a beautifully made thing-- the way it is shaped by the stairs and underlined by that row of children, not to mention all of the little interactions that can be read. Add to that the cumulative level of genius represented by these people. I love this photo. when I first looked at this today, Mike, I started to get worried. Maybe you were "losing me" so to speak. I'm not a jazz fan. In fact, I'm not really a fan of anything from the '50's. Maybe it's my having been born at the end of the baby boom (1959) and having 50's nostalgia rammed down my throat for too much of my formative years. Maybe it's my living on the edge of the continent and hearing too much about how incredible New York is/was/will be. Now, none of this is your fault. But it started to make me think that a list of photographs that are great because of their cultural significance becomes problematic precisely because cultures are not homogenous and whatever's significant to you (or me or whomever) can't, almost by definition, be significant across the board and therefore the photo's greatness fails. But, (and this is the big "but"), I loved your inclusion of the photo of the guy in front of the tank at Tianneman Square. I'm from Vancouver. I remember *exactly* what I was doing that day. I went to a memorial church service (and I don't go to church, as a rule) and attended a candle-light mass. I know people who know people who were there. It was a v.big deal in this town. So. *That* photo resonated. And I can't wait to see what you put up next week. Keep it going Mike. "smack in the middle of its last great period of innovation." I had Joshua Redmond's "Beyond" playing in the background when I read that sentence, with Avisha Cohen cued up to follow and could not help but think, "Man that cat is not paying much attention to what's going on around him these days!" There is an amazing jazz rennaissance going on that has little to do with the curatorial approach exemplified by Wynton Marsalis.